News & Events - Let's Bead! News & Events at Let’s Bead! Join Irene Grassmann to learn more about the Ukrainian Easter Egg tradition, the Pysanka. Irene has years of experience teaching this traditional decorating technique and will be giving a Free Demonstration at Let’s Bead! 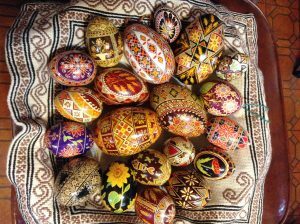 Or register for our Make a Pysanka Class with Irene on March 30th from 11:00 – 2:00 PM. Call 585-586-6550 for registration and more class info. for an evening of crafting to benefit homeless pets! During Beading for Bunnies, you will create a “Cotton Tail” bracelet with semi-precious stones with the help of Alice & Beth, while you enjoy a glass of wine. Your registration fee of $35 will support homeless pets at Lollypop Farm. Invite a friend who would love to craft with you! Beading Social invites you and your friends to join us every Wednesday night from 6-8 PM for beading and jewelry making, friendship and good times. You bring your projects, we’ll bring the music and the refreshments. Beading Social is free and participants will get 10% off their purchases that evening. NEW: Attendees will be entered into a drawing for a $10 gift card at the end of each month. Here is how it will work – Each week that you attend our Beading Social, your name will be entered. At the end of the month, there will be one drawing. The more you attend, the more chances you get!